Richard Wilson lives in London. He is the author of “Titanic Express”, published in 2006 and the Icon book, “Don’t Get Fooled Again”, which came out in September 2008. 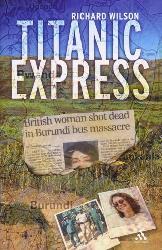 “Titanic Express” takes its title from the bizarre name of the bus that was ambushed by Burundian rebels in December 2000, close to the capital Bujumbura. One of the 21 victims of the attack was Richard Wilson’s elder sister Charlotte, who had been working as a teacher in neighbouring Rwanda. Her Burundian fiancé – another Richard – who was travelling with her, was also killed. “Don’t Get Fooled Again” is a very different kind of book from “Titanic Express”, but there are some common elements. Both, in their own ways, centre around a search for the truth, personally and politically. Both also look at how we can distinguish what’s true from what isn’t – or at least how we can tell a reasonable assumption from a completely nonsensical one – and why it is that these things matter. And both look in some detail at the issue of conspiracy theories, and the damage that they can do. 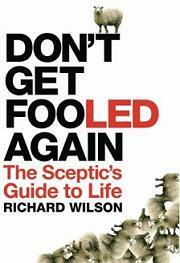 But “Don’t Get Fooled Again” is also a much lighter book, aimed at a much more general audience. Scepticism seems in many ways to be a prevailing sentiment just at the moment. Many feel distrustful of much of what we read in the media and hear from politicians, yet are also tired of the baseless paranoia peddled by conspiracy theorists of various shades. “Don’t Get Fooled Again” explores the territory between naivety and paranoia, highlights the extent to which we are all vulnerable to deception and delusion, and tries to put forward some practical ‘rules of thumb’ to minimise the risk of being fooled in future. Good website but your Amazon listing seriously undersells your book, Titanic Express. Went there out of curiosity and found nothing at all but a couple of content-less (though positive) review quotes. A pity. I share your agent, by the way, and sceptical outlook. Await DGFA with interest. Thanks for pointing this out, Martin – I’ve done some digging, found a better link, and updated this page! Simon – thanks so much for your generous review – I’m really pleased that you liked the book, and was interested to see which aspects would stand out for someone coming to it afresh. A very succinct summary, I thought – thanks again! I’d like to exploit the title of your Amnesty blog. I know the notion of Article Eight’s not proprietary but in case you had any ideas for using it more widely I’d like to have a word with you first. Can you e-mail me? That last message was a message to you – no need to publish it on the About Page. Incidentally underneath the blog posts, the reference to the comments is rather lost, sandwiched between Tags and Pages. It might be more inviting if it was easier to spot. I’ll post it on Amazon too. Many thanks, Tom! I’m really pleased that you liked the book – and the blog. I’ve set a post to go up tonight, reproducing the review and linking to your website. Why is this blog ‘dead’? I’m reading DGDA -charity shop gold! – and you seem to have vanished.